Three zones | Hi, I'm Victor. Our greatest lessons surface when we move between all three. This is where life is normal. You know your surroundings and rhythms well. It’s not that life is perfect, it’s simply known. But, one day, something pushes your hopes – something beautiful that you want to propagate or something awful that you want to stop. You begin feeling the need to do something about those hopes but you don’t know everything you need to know or have everything you need to continue. You begin to move to the edge of comfort…to the brink of something new. A leap needs to happen. Before going any further, you need to be more clear about what you’re leaping towards and why. That takes work. Hard work of looking inside yourself. But if you do that work, it will give you much needed clarity as you leap. Once you have that clarity, you can start considering what Learning may actually look like. Should you go to school? Build something of your own? Take a series of classes? Travel? Read a combination of books? Work alongside an expert in your field? And, you won’t want to do this alone. Once you begin exploring those leaps, think about who you need to join you. You will need another set of eyes, ears, and hands at various points in this endeavor. Who will leap with you? Now, things are foreign, new, uncertain. Many things about comfort are left behind at this point – material things, relationships, maybe even your sense of home. Now that you’re here, a few simple goals will keep your vision clear. What do you hope to accomplish right away? By the mid-point? By the end? Work your way backwards from the end and consider the most helpful daily/weekly habits that could bring you to those points. You may not know all of the right things, but this is where your team comes into play. Pay close attention to everything happening externally and internally. If you’re truly here, many things are new and challenging. Document this journey like a journalist. These are rare and important days. The more you document, the more you’ll have to reflect upon and share along the way. Ah. the dreaded panic zone. This is where something valuable breaks. You’ve leapt too far, climbed too high, you’re scared and you just want to retreat back to the cozy walls of Comfort. It’s true. It’s hard to learn here. If we don’t have resources, relationships, or hope…we can’t think straight. But, we only know this space once we’ve reached it. Move slowly here. Work with your community to simply take a few of steps back. Keep learning. Comfort will become less appealing but more available. The zone will get bigger because you’ll have more opportunities and resources. 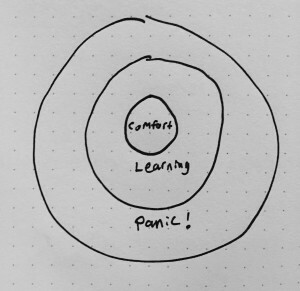 It’ll be far easier to stay there and harder to leap into learning. But, the learning space will also grow larger – not because you know less, but because you became aware of how much you don’t know. Like visiting a large and amazing city, it will be both daunting and exciting. The panic space will shrink because fewer things make you panic now that you’ve experienced so much. I’m curious how to best help people take these leaps…throughout their entire lives. That’s why this needs to exist and why I hope you’ll design a leap of your own.